Q: Is this a parody of "Dawn of the Dead"? Q: Does the comedian Colin Mochrie have a cameo as a zombie in this? The best comedy of the year! Here in the States they don't show too many foreign movies, even if they are from the countries like UK. When they show them, however, they tend to outdo some of the American movies in the box office. Although the British movies are rarely shown here, they're a guaranteed success - do you recall the popularity of the last year's "28 Days Later"? Well, this movie is even better - it's a hilarious combination of comedy, social parody, tragedy and drama, spiced with the references to every zombie flick ever made. Some references are pretty slim, though - for example "We're coming to get you, Barbara!" is a reference to "The Night of the Living Dead" - a reference that many people (including George Romero!) didn't get. Most of the actors are unknown to an average American, yet they played great! 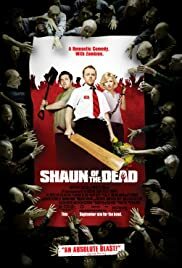 I hope that movies like "Shaun of the Dead" will make big wigs in Hollywood realize that there are many great foreign movies, and that integrity is always better than crude remakes which the States are so notorious for... I encourage everybody to come and see SOTD - the best comedy of 2004. 228 of 313 people found this review helpful. Was this review helpful to you?